The first record of the name Belograd appeared on April, 16th, 878, in a Papal missive to Bulgarian ruler Boris I. This name would appear in several variants: Alba Bulgarica in Latin, Griechisch Weissenburg in High German, Nándorfehérvár in Hungarian, and Castelbianco in Venetian, among other names, all variations of 'white fortress'. 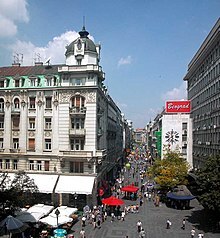 For about four centuries, the city would become a battleground between the Byzantine Empire, the mediaeval Kingdom of Hungary, and the Bulgarian Empire. Basil II (976–1025) installed a garrison in Belgrade. 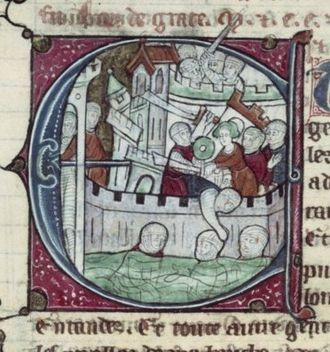 The city hosted the armies of the First and the Second Crusade, but, while passing through during the Third Crusade, Frederick Barbarossa and his 190,000 crusaders saw Belgrade in ruins. With 6,924 companies in the IT sector (according to 2013 data[update]), Belgrade is one of the foremost information technology hubs in Southeast Europe. Microsoft's 'Development Center Serbia', located in Belgrade was, at the time of its establishment, the fifth such programme on the globe. Many global IT companies choose Belgrade as their European or regional centre of operations, such as Asus, Intel, Dell, Huawei, and NCR.The most famous Belgrade IT startups, among others, are Nordeus, ComTrade Group, MicroE, and Endava. IT facilities in the city include the Mihajlo Pupin Institute and the ILR, as well as the brand-new IT Park Zvezdara. Many prominent IT innovators began their careers in Belgrade, including Voja Antonić and Veselin Jevrosimović. 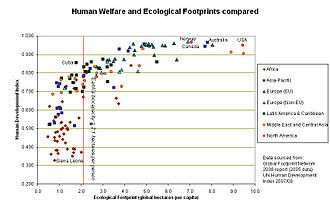 ^ a b c "2011 Census of Population, Households and Dwellings in the Republic of Serbia: Comparative Overview of the Number of Population in 1948, 1953, 1961, 1971, 1981, 1991, 2002 and 2011, Data by settlements" (PDF). Statistical Office of Republic Of Serbia, Belgrade. 2014. ISBN 978-86-6161-109-4. Retrieved 2014-06-27. ^ "About the Museum". eng.msub.org.rs. Retrieved 2019-03-30. ^ "Military Museum | About Us". www.muzej.mod.gov.rs. Retrieved 2019-03-30. 1 Kosovo is the subject of a territorial dispute between the Republic of Kosovo and the Republic of Serbia. The Republic of Kosovo unilaterally declared independence on 17 February 2008, but Serbia continues to claim it as part of its own sovereign territory. The two governments began to normalise relations in 2013, as part of the Brussels Agreement. 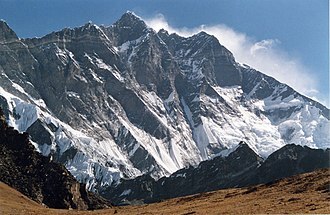 Kosovo has been recognized as an independent state by 102 out of 193 United Nations member states. 10 states have recognized Kosovo only to later withdraw their recognition. The Sava is a river in Central and Southeastern Europe, a right tributary of the Danube. It flows through Slovenia, along the border of Bosnia and Herzegovina. Its central part is a border of Bosnia-Herzegovina and Croatia. The Sava forms the border of the Balkan Peninsula. The Sava is 990 kilometres long, including the 45-kilometre Sava Dolinka headwater rising in Zelenci and it is the greatest tributary of the Danube by volume of water, and second-largest after Tisza in terms of catchment area and length. It drains a significant portion of the Dinaric Alps region, through the tributaries of Drina, Kupa, Vrbas, Kolubara, Bosut. The Sava is one of the longest rivers in Europe and among a handful of European rivers of that length that do not drain directly into a sea. The population in the Sava River basin is estimated at 8,176,000, the Sava is navigable for larger vessels from the confluence of the Kupa River in Sisak, approximately two-thirds of its length. The Sava River is formed from the Sava Dolinka and the Sava Bohinjka headwaters in northwest Slovenia, the Sava Dolinka rises at the Zelenci Pools near Kranjska Gora, Slovenia, in a valley separating the Julian Alps from the Karavanke mountain range. The spring is located near the Slovene-Italian border at 833 metres above sea level, the Sava Dolinka spring is fed by groundwater possibly exhibiting bifurcation of source karst aquifer to the Sava and Soča basins. Nadiža creek, a losing stream flowing nearby, is the source of Zelenci Pools water. The Sava Dolinka is considered the Savas initial, 45-kilometre segment, the Sava Bohinjka originates in Ribčev Laz, at the confluence of the Jezernica, a short watercourse flowing out from Lake Bohinj and the Mostnica River. The watercourse flows 41 kilometres —including the length of the Savica—east to Radovljica, downstream from the confluence, the river is referred to as the Sava. The Sava is located in Southeast Europe, flowing through Slovenia, Croatia and its total length is 990 kilometres, including the 45-kilometre Sava Dolinka and the 945-kilometre Sava proper. As a right tributary of the Danube, the river belongs to the Black Sea drainage basin and it is the largest tributary of the Danube by discharge. Belgrade Fortress, consists of the old citadel and Kalemegdan Park on the confluence of the River Sava and Danube, in an urban area of modern Belgrade, the capital of Serbia. It is located in Belgrades municipality of Stari Grad, Belgrade Fortress was declared a Monument of Culture of Exceptional Importance in 1979, and is protected by the Republic of Serbia. Belgrade Fortress is located on top of the 125. 5-meter high ending ridge of the Šumadija geological bar, the cliff-like ridge overlooks the Great War Island and the confluence of the Sava river into the Danube, and makes one of the most beautiful natural lookouts in Belgrade. It borders the neighborhoods of Dorćol, Stari Grad and Kosančićev Venac and it is encircled by three streets, Boulevard of Vojvoda Bojović, Tadeuša Košćuška, and the railway along the riverside. Belgrade Fortress is the core and the oldest section of the area of Belgrade. 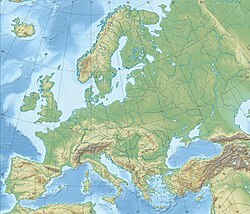 For centuries the city population was concentrated only within the walls of the fortress, the city-fortress was conquered by the Romans, was known as Singidunum and became a part of the military frontier, where the Roman Empire bordered barbarian Central Europe. Singidunum was defended by the Roman legion IV Flaviae, which built a camp on a hill at the confluence of the Danube. In the period between AD378 and 441 the Roman camp was destroyed in the invasions by the Goths. Legend says that Attilas grave lies at the confluence of the Sava, in 476 Belgrade again became the borderline between the empires, the Western Roman Empire and Eastern Roman Empire, and the Slav-Avar State in the north. The Byzantine Emperor Justinian I rebuilt the fortress around 535, in the following centuries the fortress suffered continuous destruction under the Avar sieges. The name Belgrade, not just in Serbian but in most Slavic languages, the fortress kept changing its masters, Bulgaria during three centuries, and the Byzantines and again Bulgarians. The fortress remained a Byzantine stronghold until the 12th century when it fell in the hands of the newly emerging Serbian state and it became a border city of the Serbian Kingdom, Empire with Hungary. The Hungarian king Béla I gave the fortress to Serbia in the 11th century as a wedding gift, after the Serbian state collapsed after the Battle of Kosovo in 1404, Belgrade was chosen as the capital of the principality of Despot Stefan Lazarević. The municipalities and cities of Serbia are the second level administrative subdivisions of the country. Serbia is divided into 147 municipalities and 27 cities, forming the basic level of local government, the city of Belgrade has a status of separate statistical region. Municipalities and cities are the units of Serbia, and they form 29 districts in groups. They are defined by the Government of Serbias Enactment of 29 January 1992, a city may and may not be divided into city municipalities depending on their size. 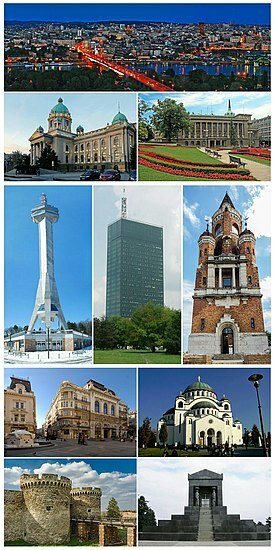 Currently, there are six cities in Serbia with city municipalities, Novi Sad, Niš, Požarevac, Užice and Vranje comprise several city municipalities each, divided into urban, Municipalities Like in many other countries, municipalities are the basic entities of local government in Serbia. The head of the municipality is the President of the municipality, while the power is held by the Municipal council. 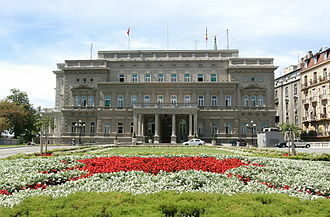 Municipal assembly is elected on local elections, while the President, Municipalities have their own property and budget. Only the cities officially have mayors, although the presidents are often informally referred to as such. The territory of a municipality is composed of a town and surrounding villages, the municipality bears the name of the seat town. Only one municipality does not share the name with the seat town and this municipality is located in Kosovo, and thus exists only on paper. The territory of the municipality was merged with part of the Municipality of Prizren in 2000 by UNMIK to form new Municipality of Dragaš and this move is not recognised by Serbian Government. Cities and city municipalities Cities are another type of local self-government, the territory with the city status usually has more than 100,000 inhabitants, but is otherwise very similar to municipality. There are 27 cities, each having an assembly and budget of its own, only the cities have mayors, although the presidents of the municipalities are often referred to as mayors in everyday usage. As with a municipality, the territory of a city is composed of a city proper, every city is part of a district. The Serbian Progressive Party is a populist conservative political party in Serbia. The Serbian Progressive Party was formed by a group of 21 former Serbian Radical Party MPs led by Tomislav Nikolić, disenchanted with the direction of the party, the pro-EU members left and formed the Forward Serbia parliamentary group. The SNS was founded and held its first congress meeting on 21 October 2008, of the Serbian Radical Partys representatives elected in the 2008 parliamentary election,21 moved to the Serbian Progressive Party, while 57 remained in the SRS. In 2011, the SNS formed a coalition with New Serbia, the Strength of Serbia Movement. 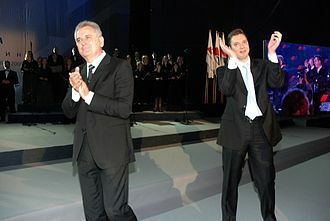 In the 2012 parliamentary election, the party led the Lets Get Serbia Moving coalition, Party leader Tomislav Nikolić defeated Boris Tadić of the Democratic Party in the second round of the 2012 presidential election. Following his election as President of Serbia, Nikolić stepped down as leader of the party on 24 May 2012, Vučić was the only candidate who ran for the party leadership, and was elected on 29 September 2012, with Jorgovanka Tabaković as his deputy. The Church of Saint Sava is a Serbian Orthodox church located on the Vračar plateau in Belgrade. It is one of the largest Orthodox churches in the world, the church is dedicated to Saint Sava, the founder of the Serbian Orthodox Church and an important figure in medieval Serbia. It is built on the Vračar plateau, on the location where his remains were burned in 1595 by Ottoman Grand Vizier Sinan Pasha, from its location, it dominates Belgrades cityscape, and is perhaps the most monumental building in the city. In 1594, Serbs rose up against Ottoman rule in Banat, the rebels had, in the character of a holy war, carried war flags with the icon of Saint Sava. The war banners had been consecrated by Patriarch John I Kantul, Ottoman Grand Vizier Sinan Pasha ordered that the sarcophagus and relics of Saint Sava located in the Mileševa monastery be brought by military convoy to Belgrade. Along the way, the Ottoman convoy had people killed in their path so that the rebels in the woods would hear of it, the relics were publicly incinerated by the Ottomans on a pyre on the Vračar plateau, and the ashes scattered, on 27 April 1595. According to Nikolaj Velimirović the flames were seen over the Danube, in 1895, three hundred years after the burning of Saint Savas remains, the Society for the Construction of the Church of Saint Sava on Vračar was founded in Belgrade. Its goal was to build a temple on the place of the burning, a small church was built at the future place of the temple, and it was moved so the construction of the temple could begin. In 1905, a public contest was launched to design the church, the breakout of the First Balkan War in 1912, and subsequent Second Balkan War and First World War stopped all activities on the construction of the church. After the war, in 1919, the Society was re-established, new appeals for designs were made in 1926, this time, it received 22 submissions. Though the first and third prize were not awarded, the submission by architect Aleksandar Deroko was selected. Forty years after the idea, construction of the church began on 10 May 1935,340 years after the burning of Saint Savas remains. Old Sava Bridge is a 410-metre long bridge, crossing the river Sava in Belgrade, Serbia. It is the smallest road bridge in the Serbian capital and is used both for car and tram traffic, the main span between the two pillars of this tied arch bridge is over 100 m in length. Two bus lines and three lines of Belgrade public transport use the bridge. The bridge was built in 1942, during the German occupation, for that reason, the purpose of the bridge was the transportation between the two river banks. The bridge had a wooden driveway until 1964, when the planners suggested the reconstruction of the bridge to the mayor Branko Pešić, after a five-year reconstruction a new concrete panel was placed. During the decade of the Eighties the first trams crossed the bridge, the traffic on the bridge has always been minor to other bridges crossing the river, due to the bad access to the bridge on the Novi Beograd side. It was one of the reasons why the vast reconstruction of the bridge did not start until 2007. The Avala Tower is a 204.5 m tall telecommunications tower located on Mount Avala, in Belgrade. The original tower was finished in 1965, but was destroyed on 23 April 1999, the towers reconstruction commenced on 21 December 2006 and it was officially opened on 21 April 2010. It is currently the tallest tower in the Balkans, the tower was designed by architects Uglješa Bogdanović and Slobodan Janjić, and engineer Milan Krstić. Construction started on 14 October 1961 and was completed four years later, between 102 m and 135 m, there was an enclosed observation deck. 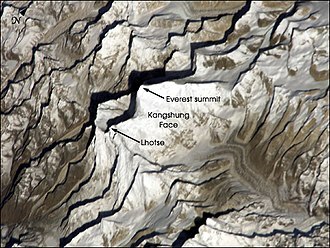 It was the tower in the world to have an equilateral triangle as its cross section, and one of very few towers not perched directly into the ground. The legs formed a tripod, the symbol of Serbian tripod chair and it is one of the small number of towers to be constructed in that manner. The tower was surmounted by an antenna, which was at first used for black, in 1971 the antenna was replaced by a new one for color TV transmission. From the height of 102 metres to a 135 metres there was an all glass area to which visitors could come via two quick lifts. The project, which was of high risk, was finished without any injuries or deaths. After completion, with the 202.87 m height it was the fifth tallest self-supporting construction in the world, after Empire State Building, La Tour Eiffel, Chrysler Building, the Avala Tower was destroyed on 29 April 1999 by NATO bombardment. Previously the power supply to the station was destroyed, but a military officer installed a backup generator. The Avala Tower was a symbol of pride and a landmark, not only of Belgrade and Serbia. The tower was one of the last buildings to be destroyed before the end of the NATO operation, a special bomb was used to destroy the tower. The blast was one of the loudest explosions heard throughout Belgrade during the NATO bombardment, in 2004, Radio Television Serbia commenced a series of fund-raising events in order to collect money to construct the building once again at the same place it was destroyed. 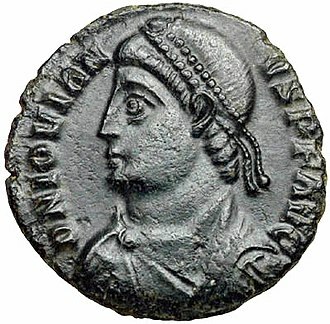 Flavius Iovianus, Roman Emperor from Singidunum. The City Hall (Old Palace) - Office of the mayor. 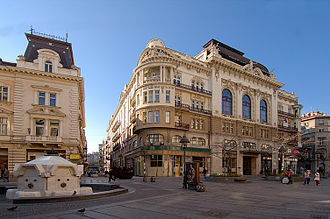 Built in 1884 according to the project of architect Aleksandar Bugarski.